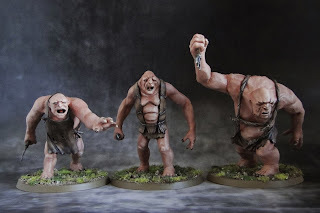 What The Faux: A burrahobbit? 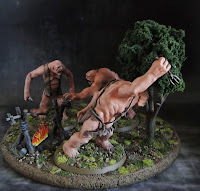 Here's the final piece in my latest "Hobbit" project. These have been waiting for painting pretty much since the day GW released them in stores. Somehow I've kept on leaving them for later. These big ugly guys are actually pretty well sculpted. 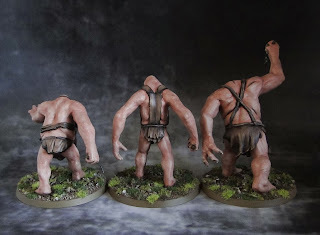 Weird proportions, with long arms and shorter legs plus the ugly faces make them look like... trolls. The one with a fork in his hand looks a bit like a larger version of plastic troll from the Mines of Moria set. While working on them I had the scene from the book in mind. The trolls are roasting meat over fire. having an argument and suddenly they hear a noise made by a burglar. I tried to capture the moment just before Bilbo is caught. 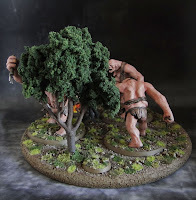 I placed an empty base behind the tree as I don't have a proper miniature right now. I think any of the new finecast versions, either the one with Sting or the other one that comes in pair with Gandalf, should fit well here. But that's just an option for the future. Brilliant, must get mine done sometime, still haven't opened the box! I'm painting these guys now. Using yours as a guide. Awesome!